Thanksgiving is this week but Capcom is already getting festive for the Holidays. Say hello to Street Fighter V: Arcade Fighter‘s new set of holiday costumes, featuring Santa inspired outfits and two very unique takes on reindeer. Watch this wardrobe in action in the trailer below. While these are labeled as holiday costumes, everything shown in the trailer is directly from commercial, Christmas lore: specifically Santa Claus and his reindeer. Cody is rocking a surprisingly stylish, long, red winter coat with the matching Santa hat. Falke is also drawing on Santa vibes, with a red coat featuring white trim and that iconic large black belt, but her coat is a far more revealing outfit than Cody’s. 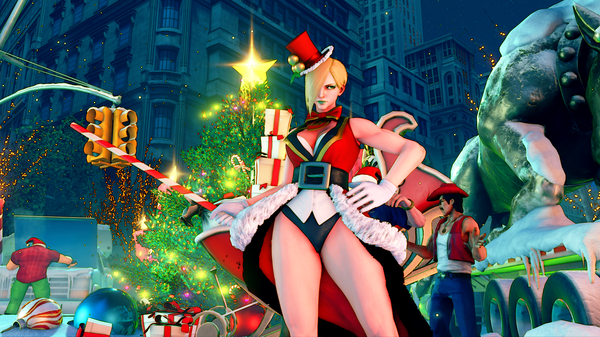 The femininity of Falke’s outfit suggests this may be a take on Mrs. Claus. Regardless of the inspiration, she’s wielding a candy cane as her weapon, and that’s pretty great. Blanka and Sakura have some of the most interesting outfits, with vastly different takes on what a reindeer costume should look like. Sakura’s reindeer costume is essentially a regular outfit. Her skirt and corset style crop top suggest winter is here with their trimmings, although there’s little warmth here. The only aspect that feels distinctly “reindeer” is her antler headband. She’s more holiday party than cosplay with this one. Conversely, Blanka’s outfit goes in the opposite direction. This full-on reindeer suit may seem more authentic, but it’s also far more bizarre looking, especially when Blanka glows. And frankly, his thick hair distracts from the fact that he has antlers on at all. Pitch your best Street Fighter V holiday costume ideas in the comments below.